Expected over the Beaufort West, Laingsburg, Prins Albert and Kannaland municipality tomorrow (Friday). 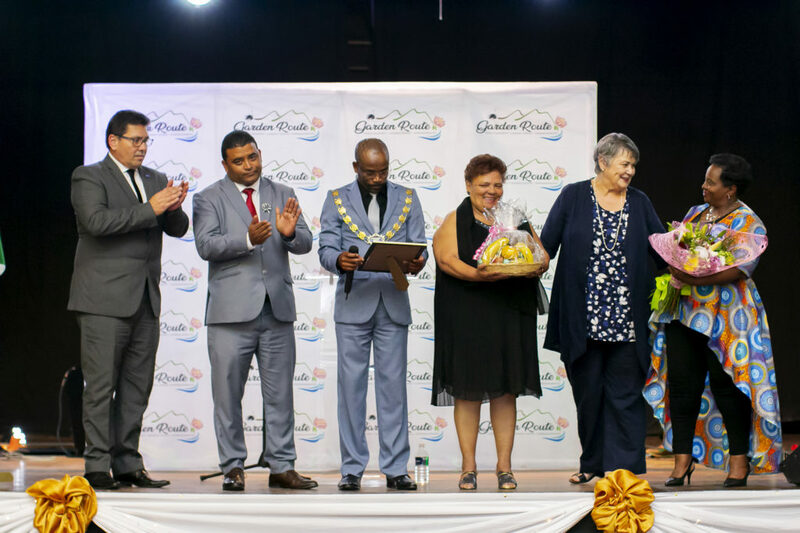 On 12 April 2019, the Garden Route District Municipality’s (GRDM) Executive Mayor, Councillor Memory Booysen, took an unprecedented step for the District by delivering its first State of the District Address (SODA). 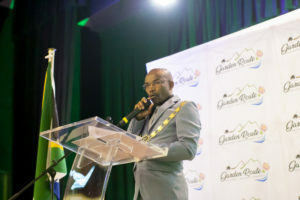 The purpose of such an address is to outline the council’s achievements, as well as to emphasise the exciting future projects and spin-offs for local municipalities (Hessequa, Mossel Bay, George, Knysna, Bitou, Oudtshoorn and Kannaland) in the region. More than 200 people attended the event, including the mayors of all b-municipalities, councillors, faith-based community leaders, business owners, stakeholders, media and municipal officials. The programme was directed by the GRDM Speaker, Cllr Eleanore Bouw-Spies. In a moment of reminiscence, Bouw-Spies touched on how council, even before she became speaker, have been able to take non-partisan decisions to the benefit of the region’s brand and economy. “I might not have been actively involved at the district council, but since my appointment as speaker late last year, I have been responsible for mediating some vigorous – sometimes robust debates, but in my objective view as the Speaker, I have also seen how both sides of the house have been in agreement on many occasions. A prime example of our synergy and decisions made in the best interest of our region was changing our municipality’s name and visual identity. Have you ever seen a name-changing process unfold with such ease as well as a new logo adopted without much hassle? The transition was indeed a beautiful, inclusive and a well-thought-through process,” she said. Garden Route DM Speaker and Programme Director, Cllr Eleanore Bouw-Spies directed the Garden Route DM SODA. Empowerment of women and the youth. Cllr Memory Booysen (GRDM Executive Mayor), Cllr Eleanore Bouw-Spies (GRDM Speaker) and Mr Leiee Edwin Mosesi (Public Sector Provincial Manager), presents a cheque of R15 000.00 to Group of Hope Disability Group. Cllr Memory Booysen (GRDM Executive Mayor), New Horizon Pensioners Forum representative and Mr Leiee Edwin Mosesi (Public Sector Provincial Manager), presents a cheque of R15 000.00 to New Horizon Pensioner’s Forum. 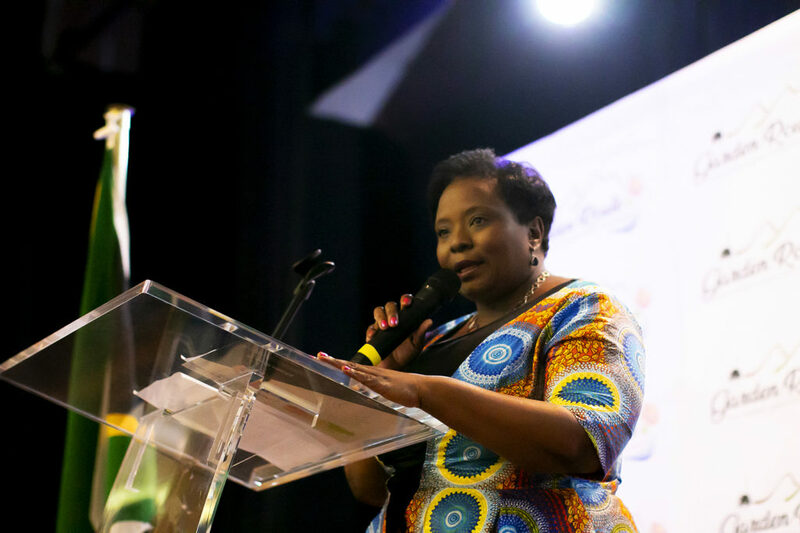 Mayor Booysen also placed emphasis on the fight to empower youth and women, which must be taken to the mainstream economy so that it reflects the diverse character of the Garden Route. “GRDM has transitioned young men and women to the driving school program, which is currently underway. Out of 26 participants in the driving school program, 23 are women. The municipality continues to provide bursaries to the youth of our district, through the office of the executive mayor. “It is through education that we can unleash creativity and cultivate a spirit of resilience among citizens,” said Booysen. “She has been with this institution for 22 years, happily married to Mr Jacobus de Villiers, blessed with two (2) children and five (5) grandchildren. I can tell you that she inherited more children at GRDM with the municipal manager being her first-born. Later during the course of the programme, Grant-in-Aid funds were handed over. The following organisations identified for this year, in no particular order, include: Albertinia Museum, Zoar Culture and Heritage Festival, Bambino Voorskool, Emmanuel Pre & aftercare Centre, Neskuikentjie Daycare, Plett Active Youth, Piet Julies Aids Action Group, Heidal Senior Citizens Club, Die Mosselbaai Benevolent Vereniging vir Bejaarde Sorg, Joey’s Babies kleuterskool, Soete Uurtjies Dagsorgsentrum, Suurvlakte Initiative, Rehoboth and Yona – Yethu Initiative. Nedbank sponsored the New Horizon Pensioners Forum and Group Of Hope Disability Group. 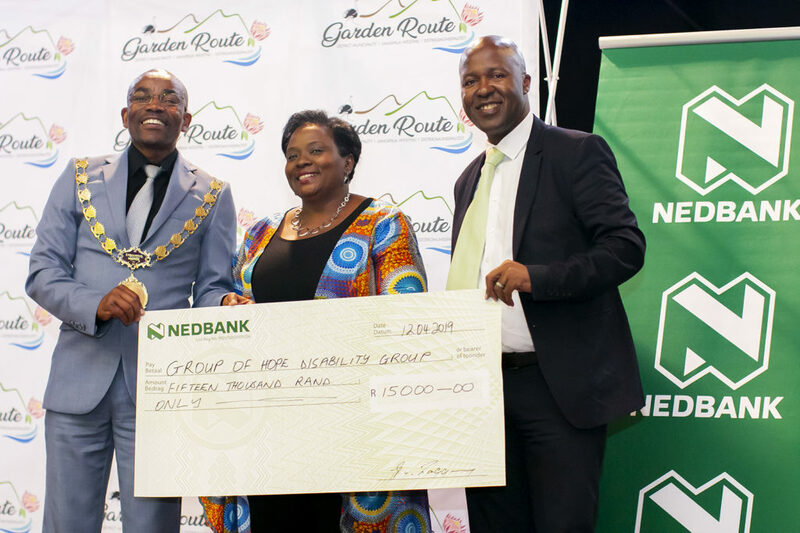 “How we share and shape our future together – a future where more and more of our people see and believe in rich vistas of opportunity; an environment where the Garden Route dream is embraced as the district dream,” Booysen said. A region that is environmentally sound in a sustainable world-renowned region. In closing, Mayor Booysen pleaded with everyone to take full advantage of their lives and to follow a path that would provide a prosperous future, harness change for the better, and build the elusive “One District” that we all dream of. 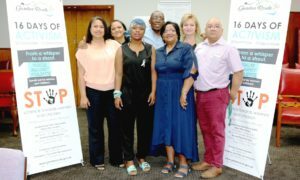 This year, on 23 November 2018, the Garden Route District Municipality (GRDM) kicked off their “16 Days of Activism Campaign for No Violence against Women and Children” at their head-office in George. The official launch took place at the GRDM and attracted a full house of representatives from local municipalities in the district, the South African Police Service, the Department of Social Services, Correctional Services, Phambili Centre and Working-on-Fire (WOF), who took hands with the municipality in this endeavor. 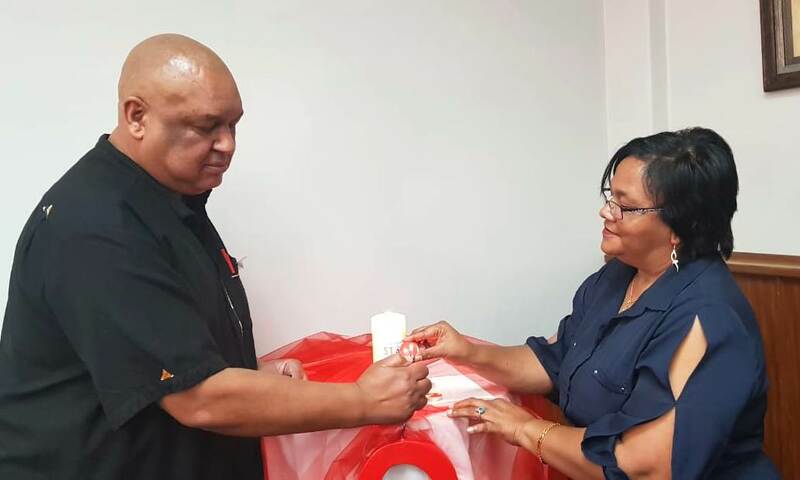 In officially opening the event, Executive Deputy Mayor of GRDM, Cllr Rosina Ruiters, lit a candle in remembrance of the victims of violence, more specifically women and children. The spirit in the chambers immediately changed when Acting Speaker of GRDM, Cllr Barnie Groenewald, welcomed the guests with the words: “Stand up, speak out, act, love and protect”. WOF representatives performed a song and poem depicting the trauma women experience when they fall victim to violence. 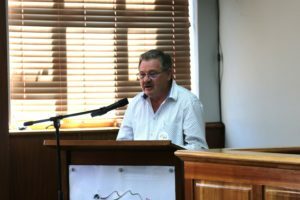 Acting Speaker of GRDM, Cllr Barnie Groenewald, welcomed the audience with the words: “Stand up, speak out, act, love and protect,” during the event. Representatives from Working-on-Fire delivered a song and poem during the event. 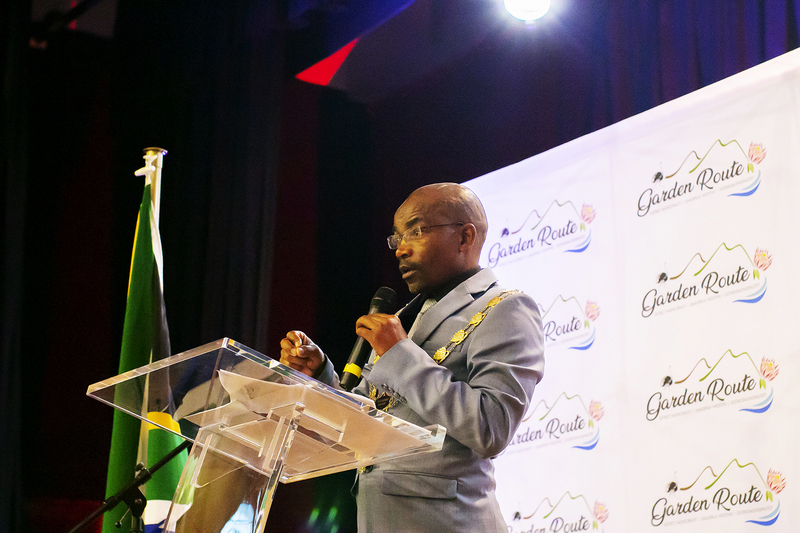 Sector Commander for the Garden Route cluster, Major-General Oswald Reddy, from the South African Police Service (SAPS), after announcing that a total of 54 to 57 people are murdered on a daily basis in South Africa, stated: “We live in a violent society where people have a high level of intolerance”. Reddy advised that people should use conflict resolution management to deal with disagreements and not use violence as a resolution. Among the 2017/2018 statistics revealed by Sergeant Adele van der Pool, 15 women and 14 children were murdered; 200 women and 104 children were sexually assaulted; 226 children and 321 women were raped. Van der Pool further revealed that 2 824 assaults were reported of which 250 were children and 991 women. Investigating Officer, Sergeant Booysen, pleaded to all representatives present: “For months, mothers, aunts and teachers are aware of violent cases that were never reported – we need you to stand up and talk, whether the perpetrator is your husband or boyfriend, let us stand together and work as a team”. Area Commissioner at the Department of Correctional Services, Ms Ndileka Booi, during her speech at the event. Ms Zingiswa William, Community Development Supervisor: Eden & Central Karoo, at the Department of Social Services, elaborated on the Department’s Victim Empowerment Programme during her speech. 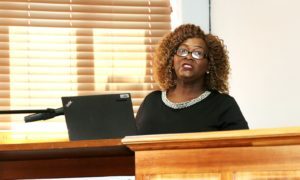 Area Commissioner for Correctional Services, Ms Ndileka Booi, during her speech stated that there are 13 cases of women who are currently sentenced at the Oudtshoorn Correctional facility after they have committed a crime as a reaction to abuse. Now they have to serve years of imprisonment, which could have been prevented, if they had reported their cases before they committed the crime. Ms Zingiswa Williams from the Department of Social Development, informed the audience about the Department’s three-fold Victim Empowerment Programme which is designed to support and empower victims of violence, whether the victims are referrals or intakes. Read more about the programme at https://www.westerncape.gov.za/dept/social-development/services/1069/37714. 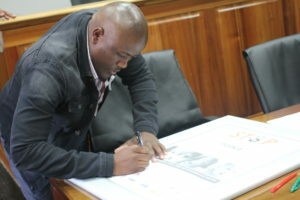 Cllr Khayalethu Lose, Portfolio Chairperson for Community Services at GRDM, signed the pledge in his support for no violence against women and children. 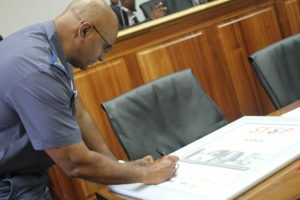 Sector Commander for the Garden Route cluster, Major-General Oswald Reddy from the South African Police Service (SAPS) signing the pledge. An activist for “No Violence against Women and Children” and resident of the Phambili Centre in Rosemoor, George, Ms Christelle Damons, shared her personal story with the audience and spoke about how she was abused and how the experience repeated itself over and over again. Through all these years she also made wrong choices, but she lifted herself up when she reported the case to SAPS. SAPS consequently advised her to be accommodated by the Phambili Centre in Rosemoor. The Centre accommodated her and took care of her and her two children during this traumatic time of her live. Her final message to the audience was: “It does not matter what you went through, talk to somebody or report the case”. From left are: Social Worker at Phambili Centre, Ms Colleen Stoffels, Portfolio Chairperson for Rural Development at GRDM, Cllr Joshlyn Johnson, Motivational Speaker and Activist for Violence against Women and Children, Ms Christelle Damons, Chief of Staff in the Office of the Garden Route DM Executive Mayor, Mr Simphiwe Dladla, Executive Deputy Mayor of Garden Route DM, Cllr Rosina Ruiters, Sergeant Adele van der Pool from the SAPS and Garden Route DM Portfolio Chairperson for Finance, Cllr Jerome Lambaatjeen. 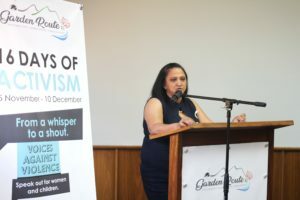 Portfolio Chairperson for Rural Development at GRDM, Cllr Joslyn Johnson, extended a word of appreciation to all role-players who took hands with Garden Route District Municipality by creating awareness about violence against women and children. Executive Deputy Mayor of GRDM, Cllr Rosina Ruiters, in her keynote address, urged members of the community and all present to always listen to their children. “We need to take everything that our children share with us serious and we need to ACT. Cllr Ruiters added: “Sometimes parents or family members hear what the children say, but we often do not believe them, due to our perception of the accused. We cannot ask our children to be open towards us as parents, yet we listen to them with a selective ear or we do not believe everything they say”. 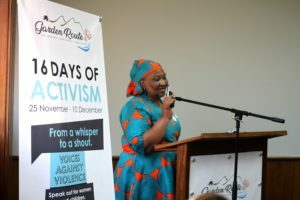 With these words, she closed off: “Let us continue to be active and vibrant custodians to fight all forms of violence against women and children and let us encourage our communities to report these crimes and through this, we all will be the beneficiaries of a better and healthier Garden Route district”. 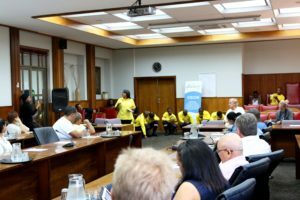 In closing, representatives present signed a pledge to support all women and children in the Garden Route in the fight against abuse, after which GRDM Portfolio Chairperson for Rural Development, Cllr Joslyn Johnson thanked all representatives who took hands with GRDM and who attended the event. – If possible photographic evidence or video footage should be taken so that the correct information is made available to the Official for the most appropriate treatment. Do not approach an injured animal or put yourself in any danger, the public can rather contact the CapeNature George Regional Office (044) 802 5300 for any wild animals found or the Outeniqua Nature Reserve on 087 087 4151 if animals are found inside Outeniqua Nature Reserve. The residential areas that border the Outeniqua mountains have experienced human-wildlife conflict for many years (especially with baboons) and therefore CapeNature is not supportive of placing out feeding stations as this will enhance conflict situations in the future. 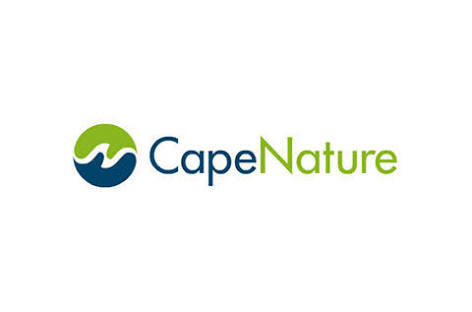 A habitat assessment will be undertaken to determine the availability of remaining habitat for wildlife as soon as the Garden Route District Disaster Management has given clearance to CapeNature to enter the burnt areas. At this stage the area is still ‘a no go zone’ due to areas still smouldering and deep hot ash. Wild animals will naturally move to alternative habitat if there is available habitat, by feeding wild animals you are firstly keeping them from a natural evacuation of the area and secondly make them dependent on feeding stations. As soon as the habitat assessment is completed, the situation will be reassessed. Help by assessing and reporting – not feeding! It is therefore advisable that the condition of wildlife be monitored rather than fed by the public. We should support wildlife by allowing corridors in order to allow them to move freely, driving carefully along public roads, and ensuring that our pets do not get the opportunity to chase wildlife that graze/browse closer to residential areas. Please drive carefully, road verges also provide food for wildlife such as small antelope and primate species as these areas are often intact and are good for grazing/browsing and will be feeding close to the road. 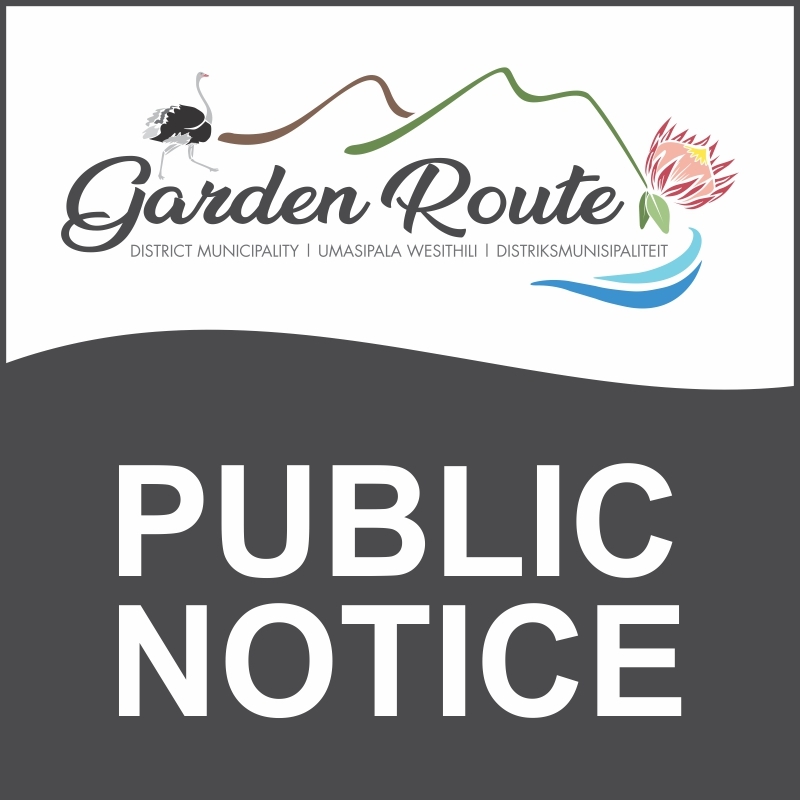 We ask that the public refrain from accessing any natural areas in the George/Knysna region where there are still active or smouldering fire lines. These areas continue to have a high fire danger risk so please help us keep everyone safe! 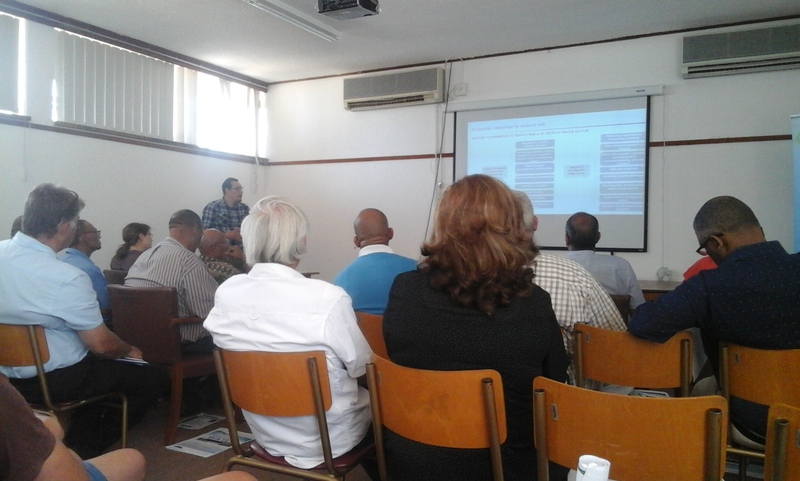 On Thursday, 09 November 2017, a Water Dialogue was held between the Kannaland Municipality, the Western Cape Government: Department of Economic Development and Tourism and local businesses and business associations within Kannaland in order to enable and facilitate a collective response to the serious drought and water security risks within the Western Cape. This dynamic and vital dialogue session included information sharing and discussions on the current status of water shortages within the province, the economic risks of the water shortages, response actions by government and business taken to reduce these risks, the development of water services and technologies, business support available and how partnerships can be formed to respond collectively to the water crisis. Business and industry are recognised as the drivers of the economy and development within the Eden district. Eden District Municipality and the Western Cape Government would therefore like to call on all businesses and industry to meter their water use, so as to identify and fix leaks and identify and reduce wasteful water usage; adjust processes and behaviour to only use water when required and in the most efficient way; apply water conservation measures such as installing water sensitive fixtures; install alternative, more water sensitive operations and methods; replace water intensive equipment with more efficient technologies, install alternative water resource technologies such as rainwater harvesting, greywater re-use, blackwater recycling, groundwater usage; recycle water used within operations; and make employees and customers aware of the seriousness of the current situation so that they do everything possible to reduce their water use at work as well as at home. Businesses are also encouraged to understand the level of risk that their Western Cape based supply chains face due to the drought and, where possible, support their supply chains to reduce their water use and plan for their own supplies. Mr Lourencio Pick addressing Kannaland businesses regarding the serious drought situation and its implications. Please visit the website of the City of Cape Town, which provides valuable information and resources that can be printed and displayed within your place of operations, http://www.capetown.gov.za. The non-profit organisation, GreenCape, can also be approached for assistance with water saving measures at no cost to businesses. Email: water@green-cape.co.za or visit: http://www.greencape.co.za/content/focusarea/business-support. The current drought can only be broken with three to four years of good rains and its impact will affect us all, for years to come. Businesses need to diversify technologies, methodologies and behaviour in order to adapt to a new “normal”. We need to take hands in preparing for the coming water security impacts within our district. All economic sectors need to take the responsibility of ensuring risk mitigation and water sustainability within their businesses. 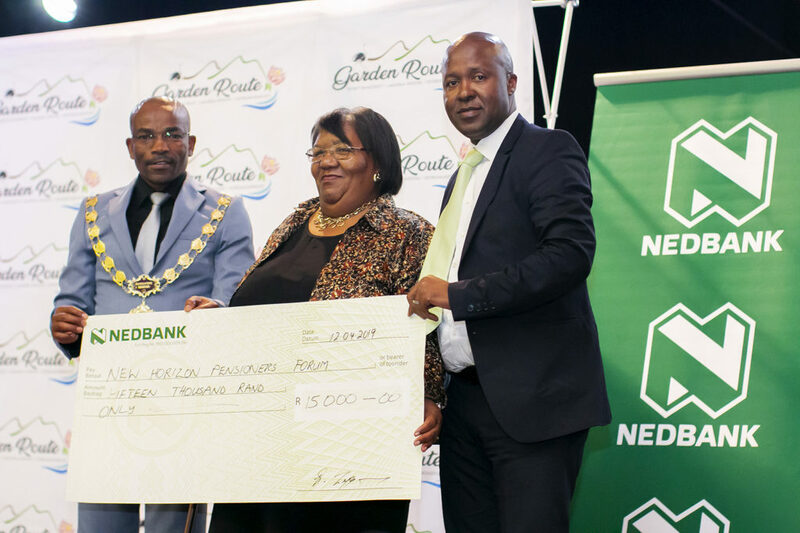 The global call to action for people and organisations to embrace the values and legacy of Utata Nelson Rolihlahla Mandela is one that is closely linked to Eden District Municipalities’ commitment to uplift people and the communities. 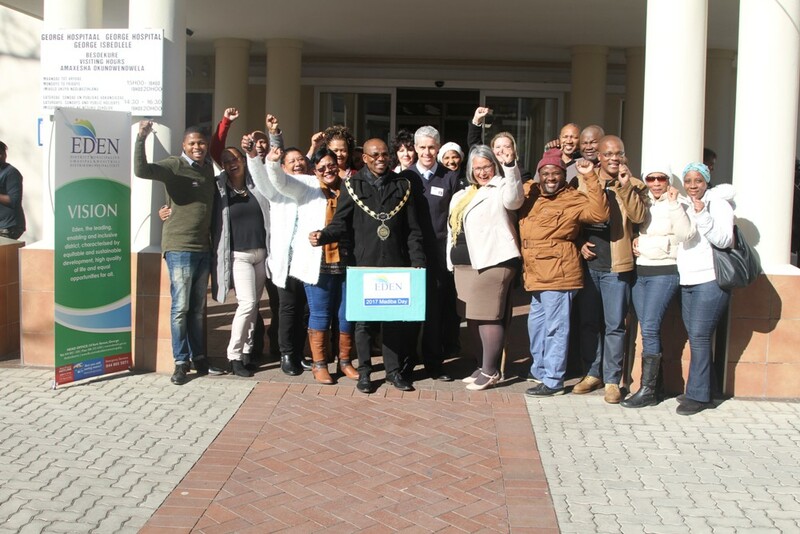 In the spirit of Madiba and his vision to create positive change to the lives of others, the Eden DM Executive Mayor, Councillor Memory Booysen, Deputy Executive Mayor, Councillor Rosina Ruiters, Mayoral Committee Members and Eden DM Officials, on 18 July 2017 visited George Hospital paediatric ward to Give love, support and handed out “Care Kits” which consisted of basic necessities such as toothpaste, toothbrush, dettol, face cloths, soap and blankets. Chief Executive Officer: George Hospital, Michael Vonk, sent a special letter of appreciation to Eden DM Executive Manager: Corporate-/Strategic Services, Ms Trix Holtzhausen and said: “On behalf of the patients and mums in the paediatric ward, I would like to thank you and your team for spending your 67 minutes at George Hospital. The generous donations and warm smiles that you all brought to the hospital would definitively have brightened the day of these children, as we all celebrate Madiba’s birthday. Please will you extend my thanks to the Executive Mayor and all of his Councillors who also came to give their time to support this worthy cause”. An excited group of Eden DM Official at the entrance of the George Hospital. Eden DM Executive Manager: Corporate-/Strategic Services, Ms Trix Holtzhausen extended a word of gratitude: “I would like to thank the officials who joined this initiative and for all their effort to make it special for the mothers and children in the hospital and by demonstrating the spirit of Mandela Day”. Assistant Human Resources Manager: Calvyn Scheepers responded, “What a day (67 minutes) well spent at George Hospital especially in the children’s ward and noticing the smiling faces of these children when our Mayor handed them the care kits. Madiba was fond of kids and it was just appropriate that we gave our 67 minutes to these wonderful kids. There can be no greater gift than that of giving one’s time and energy to others without expecting anything in return.” Let’s make Madiba day an everyday occurrence. Bandile Mbalo also mentioned: “It was so inspirational and an honour to contribute his 67 minutes to the goodwill of the Mandela day and humble to touch the lives of the children and see them walking the mile that Mandela has walked”. Umtu ngumtu ngabantu. Eden DM is very proud of the wonderful employees and how they continue to strive to give back to those in need to help build our beautiful country. Mandela Day reminds us of Madiba’s famous saying that, “what counts in life is not the mere fact that we have lived. It is what difference we have made to the lives of others that will determine the significance of the life we lead”.